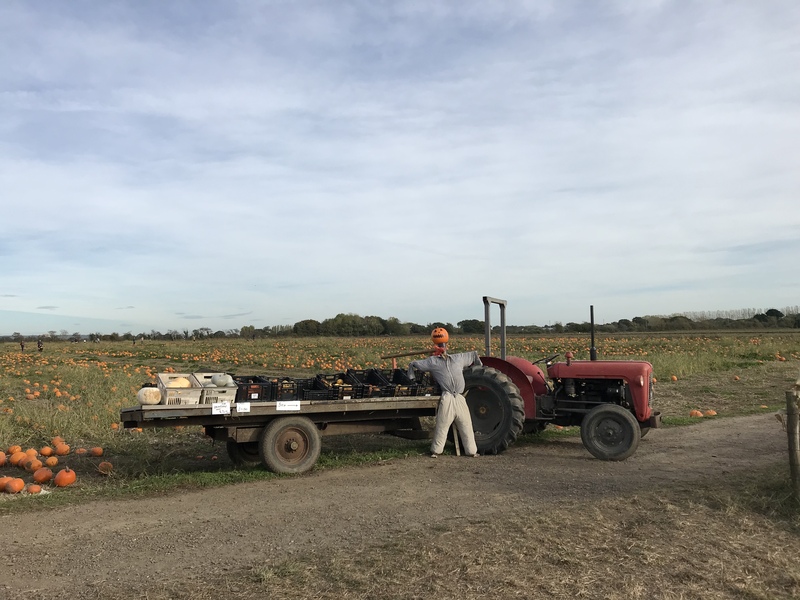 This year I went pumpkin picking on a farm for the first time ever. There’s nothing better than spending time with friends and family and I couldn’t think of anything more seasonal to do! 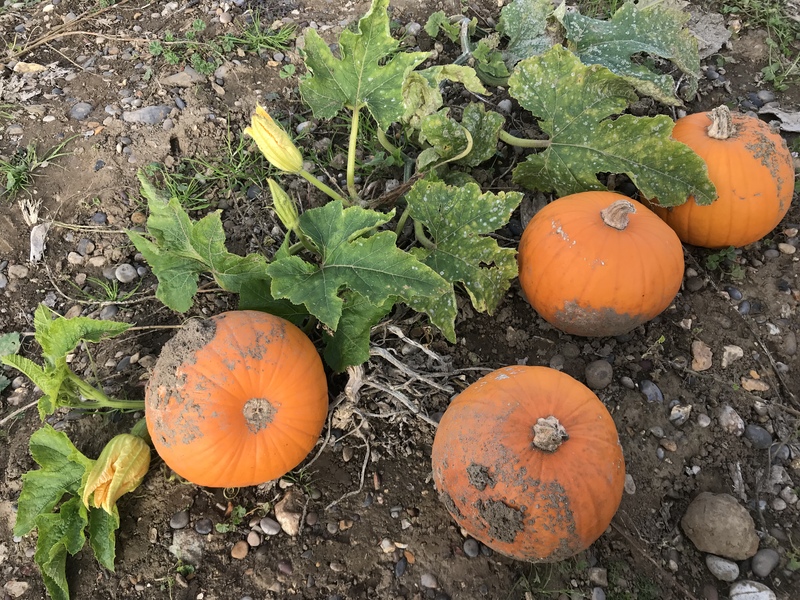 Here’s a look at my afternoon spent in the field picking pumpkins – it will certainly give you an autumn boost as the pictures are rich in colour and sum up this time of year perfectly. 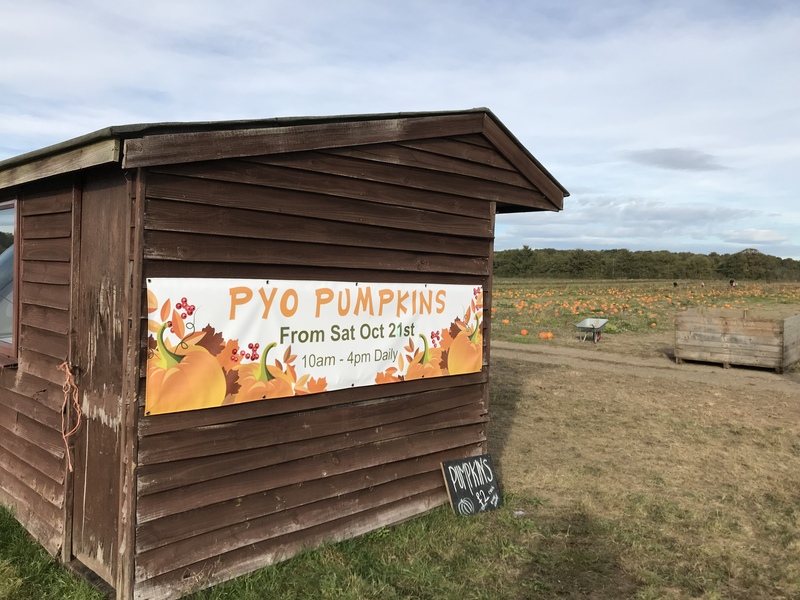 A festival display of smaller pumpkins to pick from awaited us at the entrance. Grab a wheelbarrow and pick your own at Hollam Nurseries! 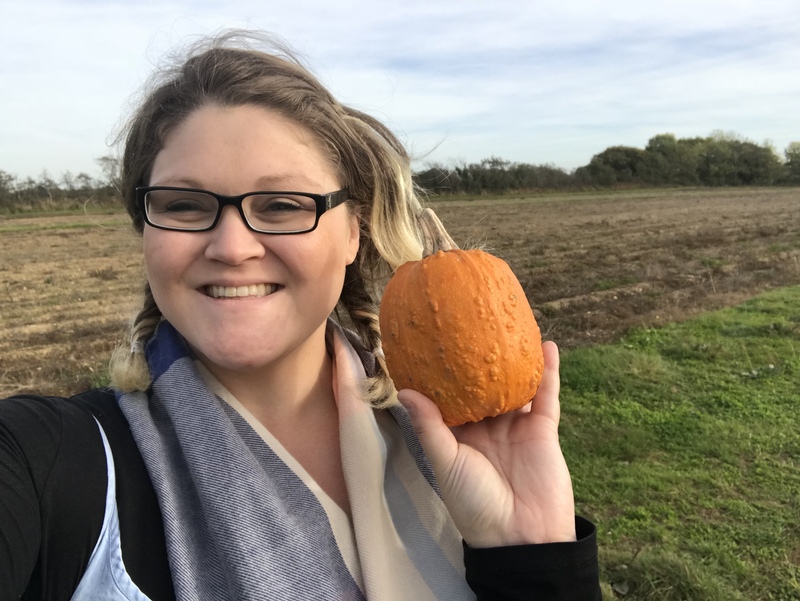 I can’t believe I’ve reached my thirties and never picked pumpkins from a field. 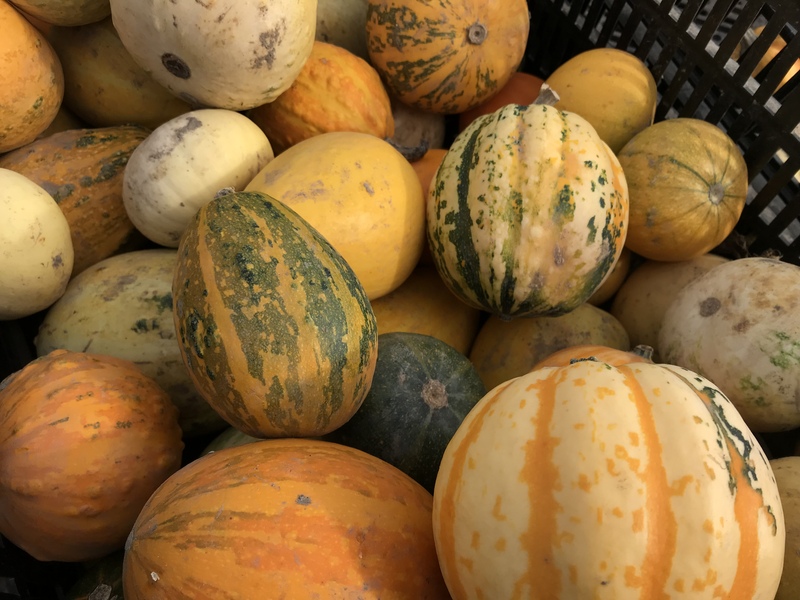 In previous years I’ve always gone too late and missed the chance to pick one fresh from the field. Here I am with a great find, this knobbly wonder went straight into my barrow and now lives in my window sill! I’ve bought from farm shops, the side of the road, people’s homes and allotments and of course, when desperate or time poor, supermarkets but I’ve never actually made it to the field before. 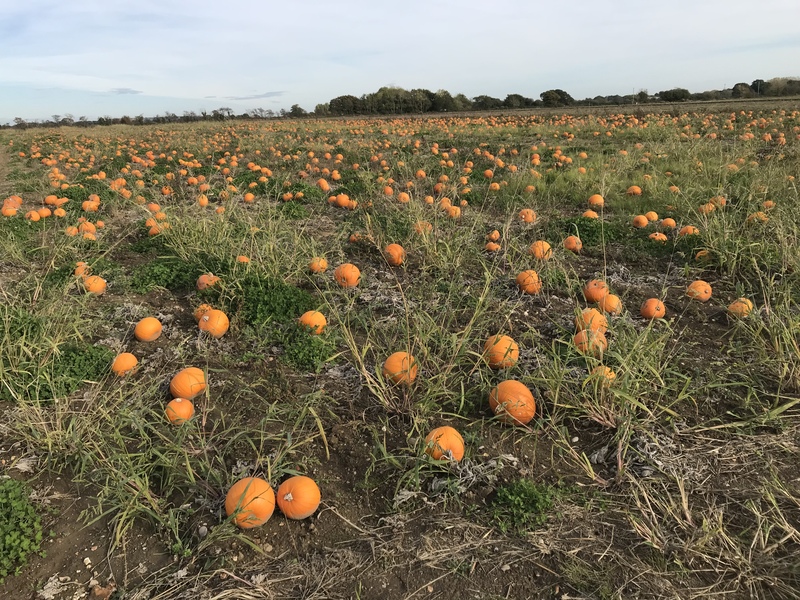 …a whole field of pumpkins! The best part of this experience is that I went with my Aunt and one of my godsons and this made the afternoon even more magical. 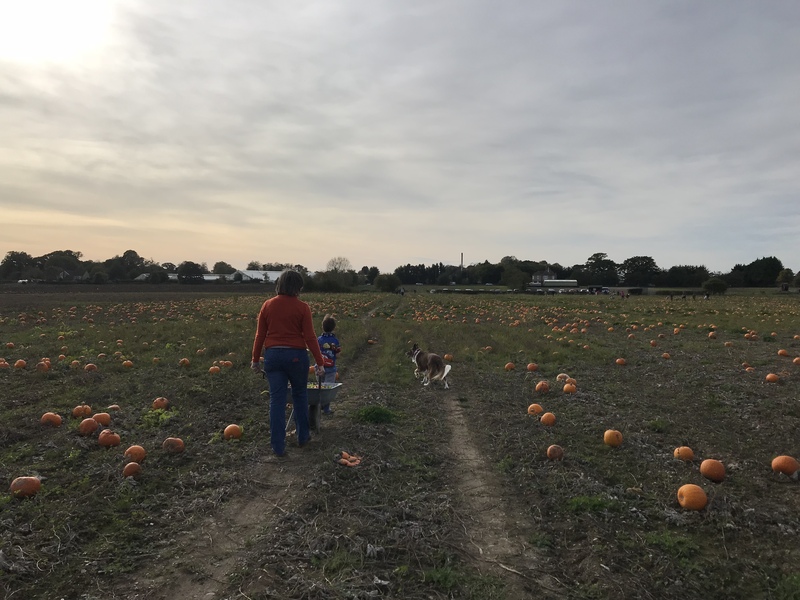 We took great delight scouring the field for exactly the right pumpkins to carve up later that day. I also picked a range to make into a display in my window at home. Every year my Mum and I have a tradition of creating festive window displays at certain times of the year. Halloween is no exception! Here we are filling our wheelbarrows. Nestled in great vines and within patches of clover lay row after row of glowing orange pumpkins in all shapes and sizes. 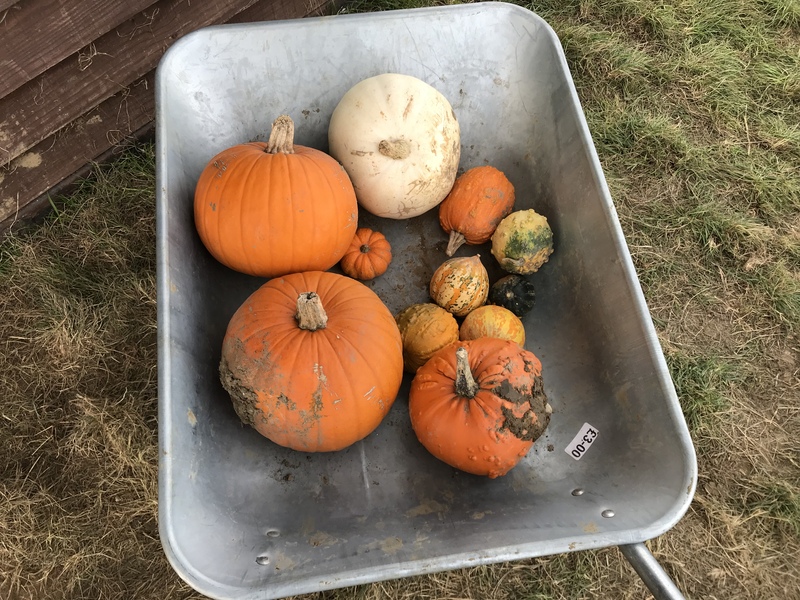 Beautifully muddy pumpkins ready to be picked and carved! 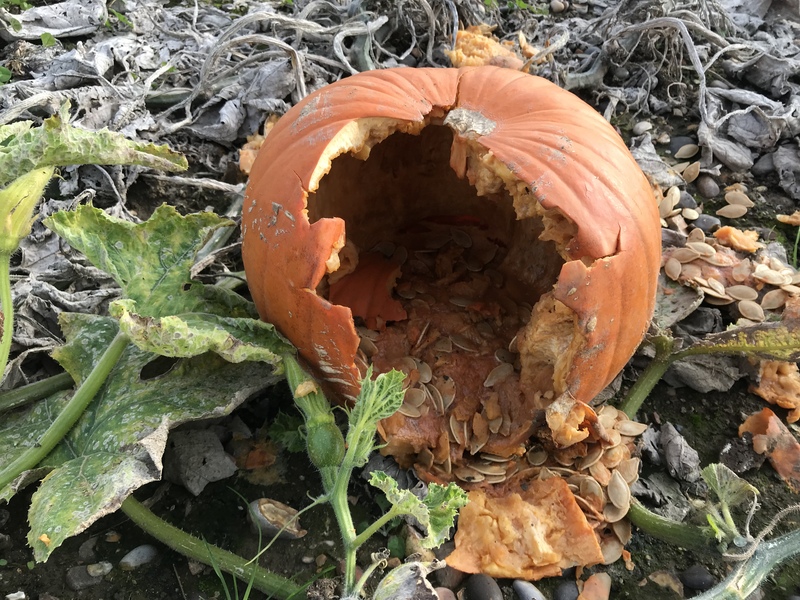 Not many of the pumpkins were in a bad way. I kind of wanted this one as it looked really gooey, and a bit gross – perfect for Halloween! We went to a local nursery called Hollam Nurseries which had an excellent selection. I’m a big advocate of shopping locally when I can and supporting independent businesses. 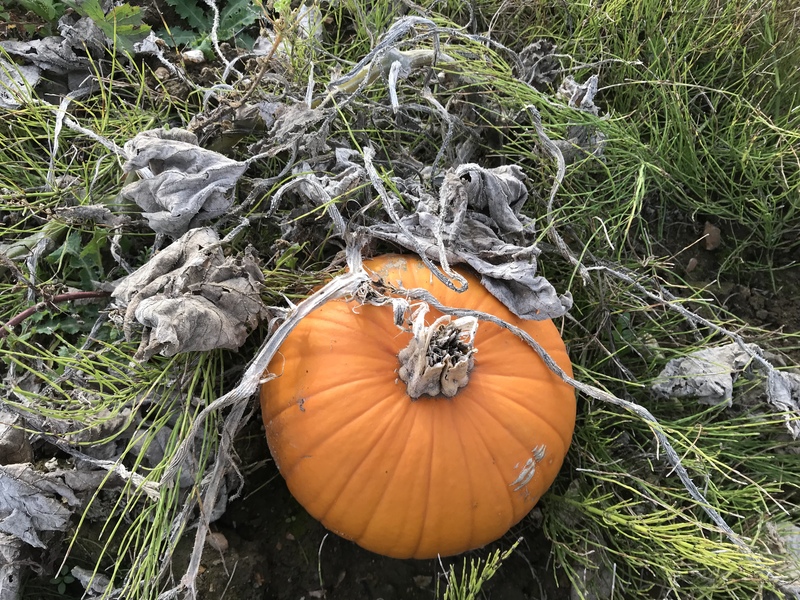 Not only did I find knobbly and striped ones but, I even found the “illusive” white pumpkin – tracking one down appears to be a bit of a goal for bloggers at this time of year. 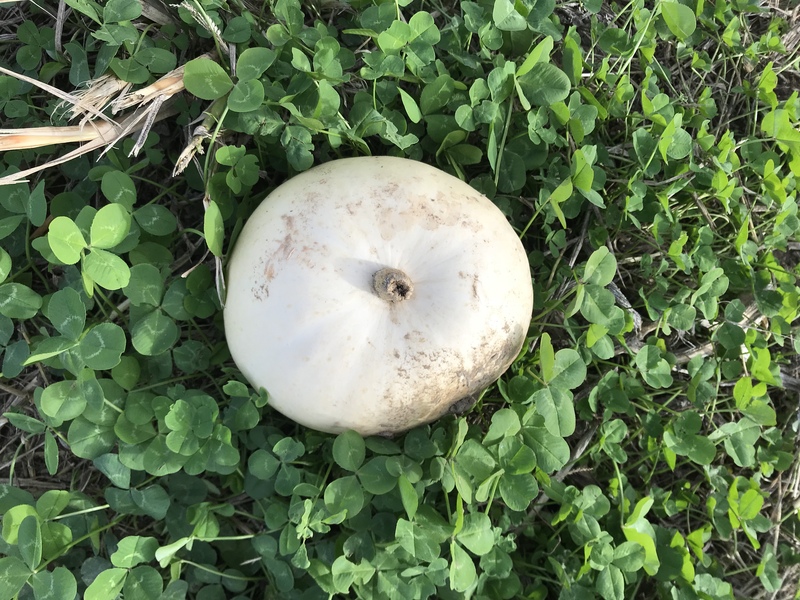 We found several white pumpkins among the orange ones! 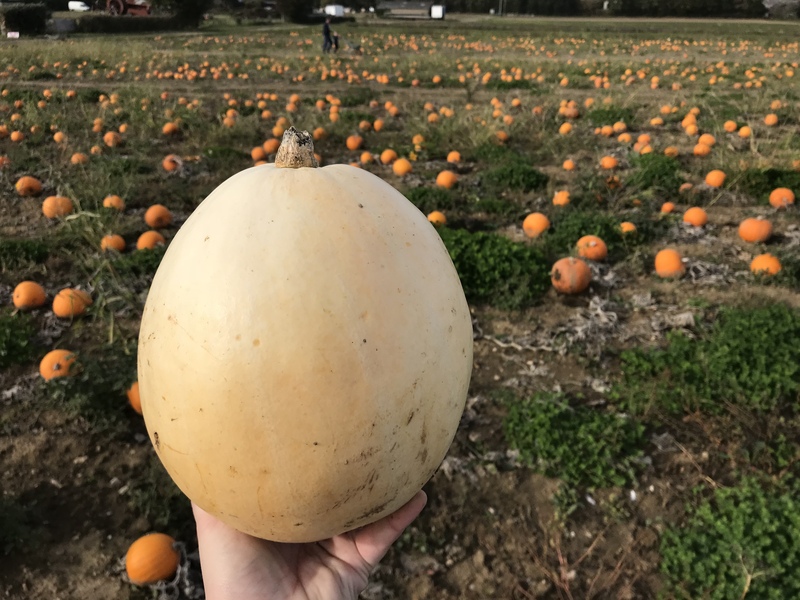 Hollam Nurseries had pumpkins in all shapes, sizes and colours! 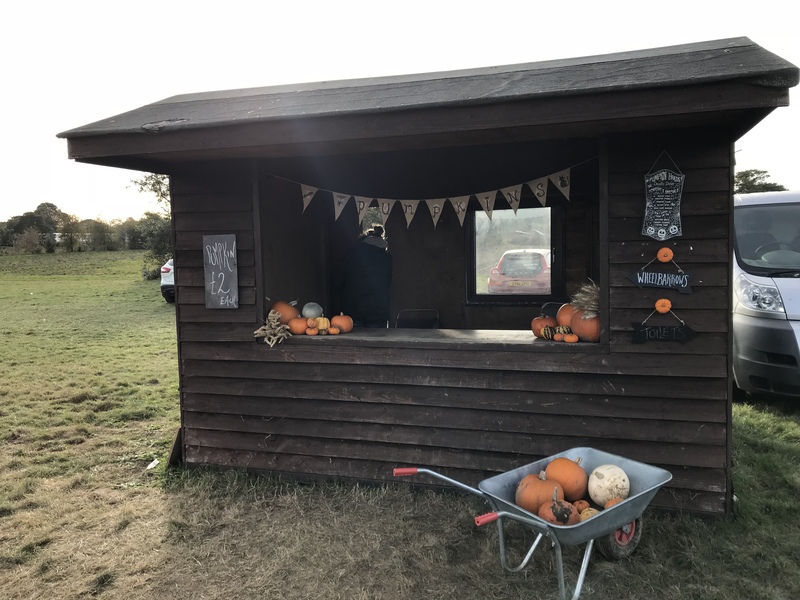 One circuit round the field and our barrows were full, we paid at the shed and headed home – an evening of carving ahead of us! Time to pay and get home to carve those beautiful pumpkins! After a fun evening carving here are our spooky creations ready just in time to decorate our homes for Halloween. 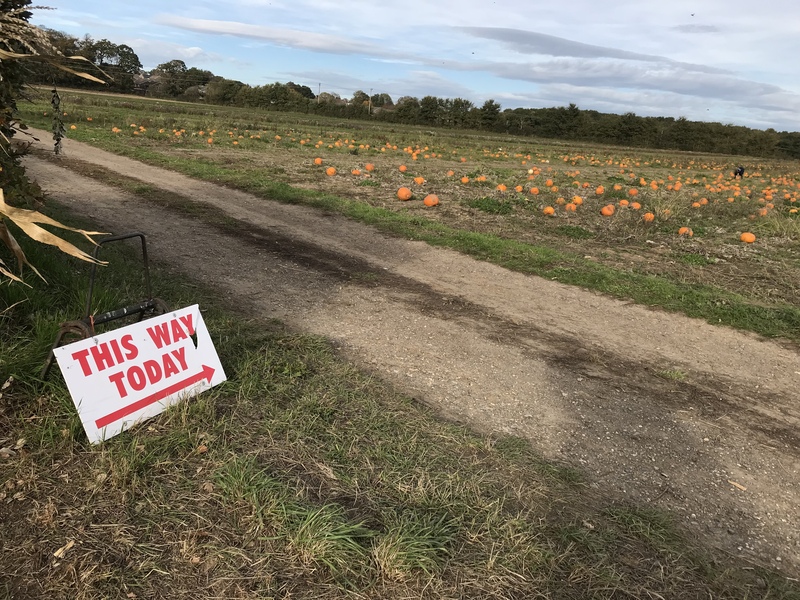 It was a wonderful experience and one I’m adding in permanently to my calendar for autumn. Now I’m ready for the spookiest day of the year, roll on 31 October! 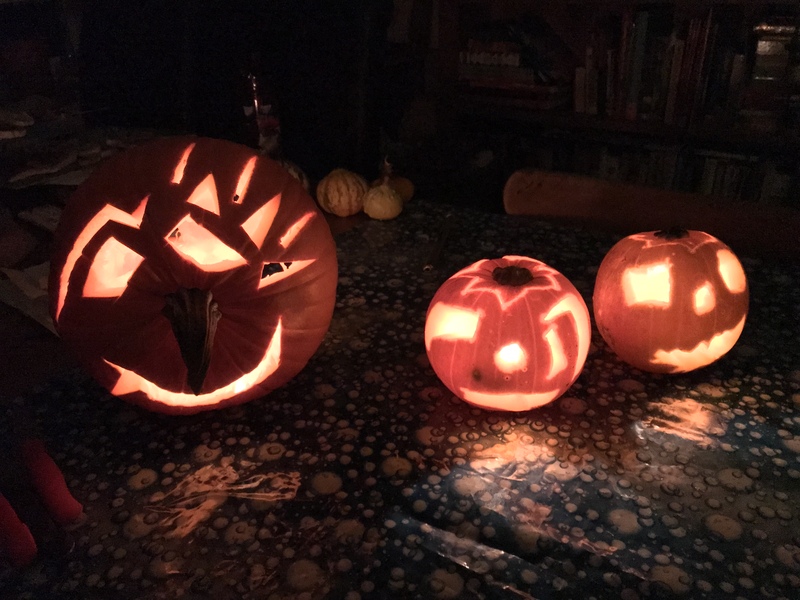 Our pumpkins lit up and ready for Halloween!